T Archer Decorator - Painter/Decorator based in Hemel Hempstead, Hertfordshire. Hi, My name is Terry Archer and I am a painter and decorator based in Hemel Hempstead where I often carry out decorating works in London & Home Counties. 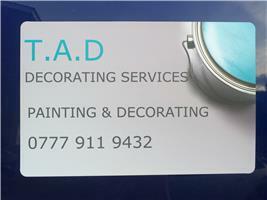 T.A.D Decorating Services was only established in 2016 due to relocation, however since forming the company, work has been constant and I have had many repeat customers. I have been decorating since 1985 and have over 30 years' experience. I specialise in both internal and external decorating works which can be seen from my photographs. I undertake both residential and commercial work, from new builds to listed buildings and am fully insured. Please do not hesitate to contact me to arrange a time and date for me to quote for your decorating needs.